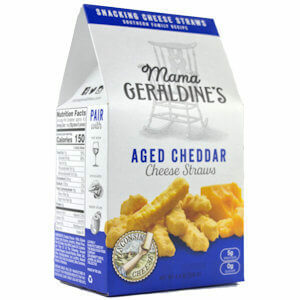 Geraldine's Traditional Gourmet Cheddar Cheese Straws are now called Aged Cheddar Cheese Straws and are know nation-wide. 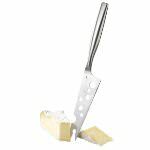 It's said that, in the South, you can't have a wedding, shower, or any social event without serving Cheese Straws. 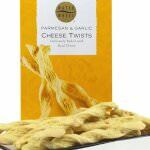 Geraldine's Bodacious Cheese Straws are known nationwide and cannot be missed on a gourmet website. 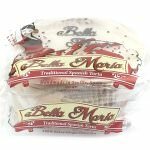 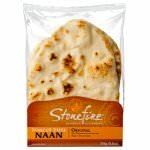 Ingredients: Cheddar cheese (milk, cheese culture, salt, enzymes, annatto), wheat flour, palm oil, butter, canola oil, contains less than 2% of the following: ground cayenne peppers, ground paprika, water, salt, whey, monoglycerids, soy lecithin, natural flavor, citric acid (accidulant), beta carotene, vitamin A palmitate.